Being prepared can help make this decision less stressful. Knowing about the services, government policies and costs of residential care beforehand can help you make the best decision, even if the decision has to be made quickly. The Commonwealth Carers Resource Centre provides carers with information and advice about their caring role and about relevant carer services and entitlements. Commonwealth Carer Resource Centres can be contacted from anywhere in Australia on 1800 242 636. Facilities that provide long term care are usually grouped into those providing high-level care and those providing low-level care. These facilities are funded by the Australian Government and are suitable for people who are mobile and need some care assistance. They may require assistance with personal care, laundry, cooking, shopping or the supervision of their medications. Accommodation is usually in bed sitting rooms with private or shared bathroom facilities. High-level care accommodation provides 24 hour nursing care for its residents, and is staffed by nurses, assistants or personal care assistants. Generally they are most suitable for a person in the later stages of dementia, or those with other medical conditions. The Australian Government funds all high-level care residential facilities. These are units designed specifically for people with dementia and they can be classified as either low level or high level depending on the level of care provided. Not all people with dementia require a specific dementia unit. People with special care needs, such as those who may not be safely accommodated in general residential facilities, are best suited for these units. The ACAT will determine the level of care needed by the person with dementia. The team will assess their needs and recommend appropriate types of residential care and provide details of facilities which may be suitable. Any concerns or issues that you may have can be discussed with the team. As applications will usually have to be made to several facilities it may be necessary to visit many places. Try to work through the list of facilities in an organised way taking notes as you go. If possible, take a friend or family member on the visits. Trust your intuition and common sense when assessing residential care facilities for a person with dementia. What is the attitude of managers and workers – do they listen to you and ask for information? Is it OK for you to come to help the person with dementia eat and shower? Can the person have his or her own doctor? Are you satisfied with medical services and specialist services? Are there procedures in place in case of fire? Has the fee structure been fully explained? What are the individual resident’s rights– own belongings, pets, mail, religious beliefs? Are you satisfied with the services and range of activities and choices for recreation? Are you satisfied with visiting times and access for family members? Are there additional services such as hairdressing and massage provided? Is there assistance for you and the person with dementia in preparing for the move? Will you be asked for suggestions and comments? Is there a policy for having your concerns looked into? Are surroundings such as buildings, grounds and individual rooms suitable? Can you join a residents’ and relatives’ committee? Based on The carer experience: An essential guide for carers of people with dementia, Commonwealth Department of Health and Ageing. Once a place becomes available in a residential facility a decision may need to be made very quickly, so it is helpful to plan the move in advance. Many people with dementia can be disturbed by change. Explain simply and gently where and why they are moving. Emphasise the positive aspects such as new friends and enjoyable activities. If at all possible, introduce the person with dementia to the new facility gradually so that the place becomes a little more familiar and a little less confusing and frightening. Sometimes of course this is just not possible, especially if the move has to be made quickly. Ensuring that their new room has as many familiar items as possible may help with the move. Family photos and familiar prints or paintings on the wall and familiar bed coverings can make the new room look a little like their own bedroom at home. Label all personal items with large, easy to read identification. During this initial moving stage it will take time for both the person with dementia and their family and carers to adjust to the new situation. Expect a period of adjustment. People do settle. Many actually do better in a structured environment – they feel more secure and get more stimulation. There is no right number of times to visit or length of time to stay. Some people want to visit frequently during this time. Others will want to rest and recover from the strain of caregiving. The important thing is to make each visit as rewarding as possible. It is important to take care of yourself when the move takes place. Residential staff will be looking after the person with dementia – consider who is going to help you at this time. Use family and friends for support during and immediately after the move. 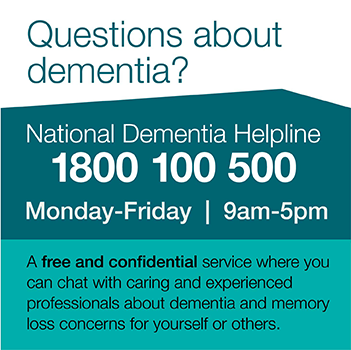 Know that you can call the National Dementia Helpline on 1800 100 500 if you need someone to talk to about how you are feeling. Dementia Australia is the national peak body for people living with dementia, their families and carers and provides leadership in policy and services. To find out more, contact us or call the National Dementia Helpline on 1800 100 500.